Matt Grapenthien entered heads-up play against Todd Brunson in the $10,000 Seven-Card Stud Championship with a slight chip lead, but the son of Doyle Brunson won the first three significant pots. Suddenly, the Chicagoan was against the ropes with a two-to-one chip deficit. Brunson extended it to nearly three-to-one, but Grapenthien narrowed the gap and the two started to swing back and forth. In total, the two exchanged the chip lead six times during the near four-hour battle before Grapenthien finally eliminated Brunson on the only all-in hand with a pair of eights against Brunson’s pair of fives. After outlasting 101 opponents, Grapenthien earned his first bracelet and $268,473, tripling his career live tournament earnings. He is convinced that he should’ve been eliminated in seventh place, in a hand that James Obst accidently called in rather than raising. Grapenthien conserved a four big-bet stack, and ran it up from there. Brunson, who started the final day as the chip leader, was denied what would’ve been his second career bracelet, but he now has over $4 million in career live tournament earnings. Day 3 kicked off with an unofficial final table of nine, including 13-time WSOP bracelet winner Phil Hellmuth. Jesse Martin was the first person to bust, bubbling the official final table, and 90-year old poker entrepreneur Henry Orenstein followed him out the door. 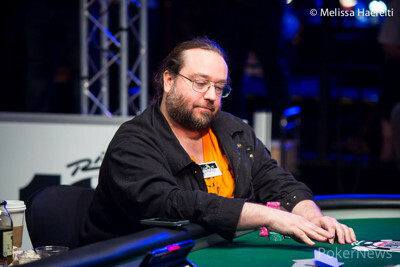 Orenstein was eliminated by Hellmuth when he got his chips in the middle with a flush draw on sixth street, but he was unable to catch a diamond on seventh and hit the rail. 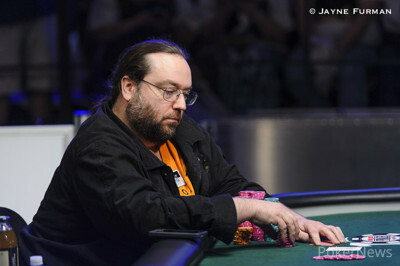 Henrick Hecklen had a short stack the entire day and eventually busted in seventh place, and Hellmuth was out in eighth. 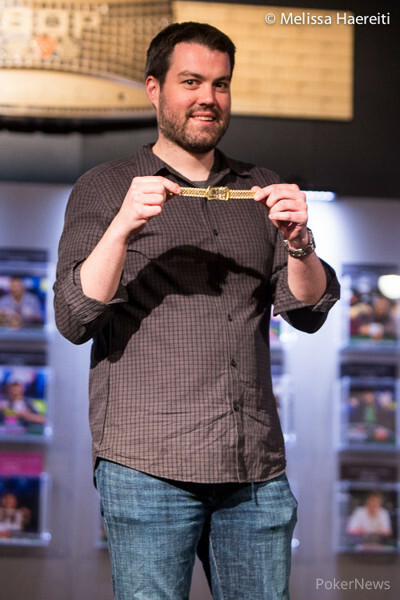 The most decorated WSOP bracelet winner was crippled when Brunson made a full house against him, and was eliminated with just a lowly pair of fives against James Obst’s pair of tens. Steve Landfish bricked in a big hand against Grapenthien, then was eliminated by the eventual winner. Ben Yu intended to double up through Grapenthien, holding the best hand, but Grapenthien improved to two pair on seventh and he was eliminated in fourth place. The quick eliminations continued as Obst was bounced in third place when Brunson made trip fives, and the tournament was down to two just three and a half hours into the final day. The heads-up match was a bit of a marathon, and it ended with Grapenthien alone in the winner’s circle with gold on his wrist. There are only a few preliminary events remaining in the 2014 WSOP, so be sure to keep your browser tuned into PokerNews as we creep closer to the most exciting tournament in poker; the Main Event! Brunson brought in on third street, and then Grapenthien completed the bet. Brunson raised to make it two bets, and then Grapenthien made it three bets. Brunson called. On fourth street, both players picked up a nine, and Grapenthien bet. Brunson called. Then on fifth, the same action occurred with Grapenthien betting and Brunson calling. On sixth street, Grapenthien bet and Brunson somewhat motioned his hand as if to say "Really?" before making the call. Then on seventh, he did the same thing, calling a bet from Grapenthien but not looking too happy about it at all. On the final street, though, Grapenthien bet 100,000, and Brunson called all in for 90,000. Grapenthien showed the for a pair of eights. Brunson only showed a pair of fives with the from his hand and that wasn't going to do it. 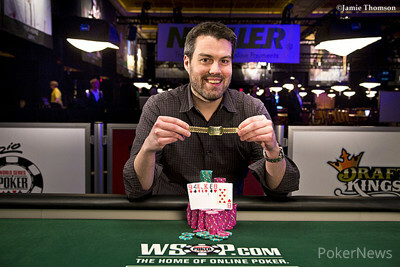 For his runner-up finish, Brunson earned $165,891 and just missed out on his second career gold bracelet. Grapenthien brought it in, Brunson completed, and Grapenthien called. Brunson led out on fourth street, Grapenthien called, and Brunson led out again on fifth. Grapenthien raised, Brunson called, and Brunson check-called a bet on sixth. Brunson check-called one last bet on seventh, then mucked when Grapenthien fanned for trip kings. The players are now on a 60-minute dinner break. Brunson brought it in, Grapenthein completed, and Brunson called. Grapenthien check-called a bet on fourth street, and Brunson led out on fifth when he was dealt the . Grapenthien raised, Brunson called, and Brunson check-called a bet on sixth. Brunson opted to lead out on seventh, Grapenthien called, and Brunson turned over for the wheel. Brunson brought it in, Grapenthien completed, and Brunson called. Brunson fired out bets on fourth and fifth street, and Grapenthien only called one bet, folding on fifth. Grapenthien brought it in, then raised after Brunson completed. Brunson called, then check-called a bet on fourth street. Brunson made a pair of aces on fifth, leading out, and Grapenthien called. Brunson improved to drips on sixth, and Grapenthien folded to a bet. Grapenthien led out on fourth street, Brunson called, and Brunson made a better board on fifth. He fired out a bet, Grapenthien called, and Brunson slowed down on sixth, check-calling a bet. Brunson check-called one more bet on seventh, then mucked when Grapenthien opened up for a straight to the king.